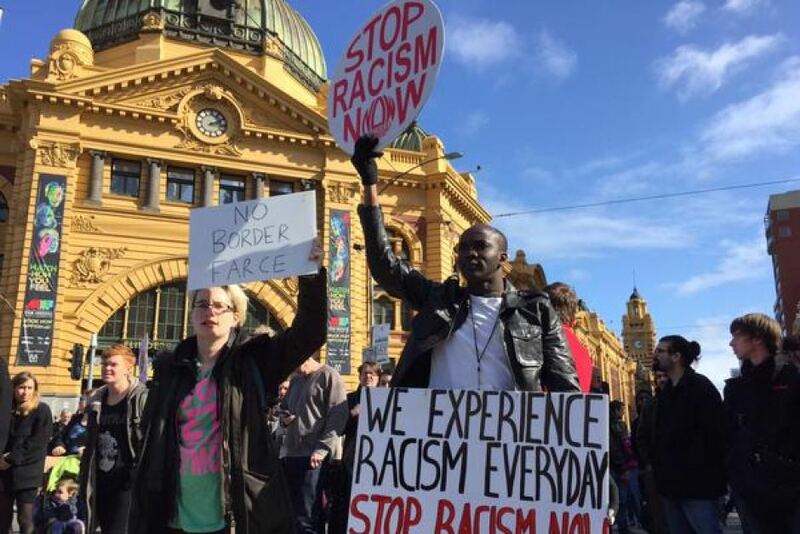 The Australian government has become increasingly militant towards asylum seekers. It started with former Prime Minister John Howard unleashing the military on people arriving by boat and implementation of the Hitleresque-named 'Pacific Solution'. In 2013, Prime Minister Tony Abbott implemented 'Operation Sovereign Borders', a military led operation to 'stop the boats'. The Liberal Party governments of Howard and Abbott have dehumanised asylum seekers and recast them as illegals, even though it is legal to seek asylum in a country regardless of whether the means of arrival would normally be termed illegal (1). This dehumanisation and recategorisation of asylum seekers has resonated with the Australian public, with most supporting the government's hard-line tactics and not caring about the human rights abuses being committed in the refugee camps of Nauru, Manus Island and Australia. To justify this $10 million, the ABF was scheduled to model its new uniforms in Melbourne at a paramilitary fashion show called Operation Fortitude. 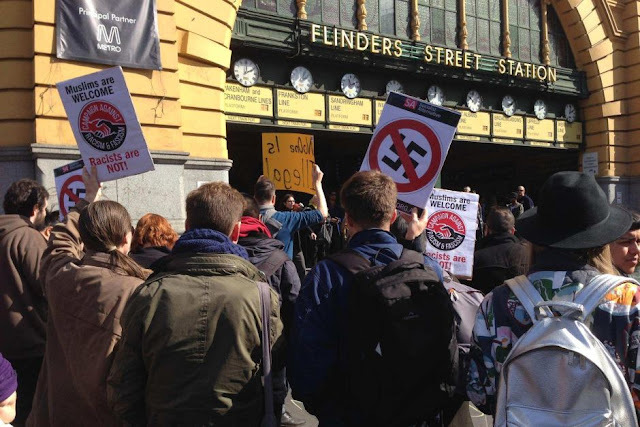 Within moments of this little parade (or more accurately, charade) being announced a large crowd of protesters descended on the Melbourne CBD and hogged the steps of Flinders St Station. Which just happened to be the exact location of a press conference to launch Operation Fortitude. The ABF and Victoria Police saw hundreds of people protesting and promptly cancelled Operation Fortitude amid a flurry of excuses, such as the press release was 'clumsily worded' (3). People all the way up the food chain to the Prime Minister denied knowledge of Operation Fortitude and opted to blame some middle-management pleb. However, it turns out that the Immigration Minister Peter Dutton, who owns the ABF, did actually receive a copy of the press release about the upcoming operation. So his excuse was that he didn't read it (4). For a Minister who has just spent $10 million decking out his fascist bully-boys with the latest fashion in jackboots, surely this is a little difficult to believe. A bit like say, a President of the USA claiming he smoked a little hooch but didn't inhale. So let's look into Operation Fortitude. It was planned that the ABF, Victoria Police and a number of other agencies would patrol the streets of Melbourne asking suspicious looking characters for their 'papers' in order to identify 'illegal immigrants'. There's a few issues with this. Firstly, who the hell carries their 'papers' around. It is not a legal requirement to roam the streets of Melbourne with birth certificate or visa in hand. Secondly, there are 62,000 illegal immigrants in Australia (5). Most of these are not asylum seekers because they asylum seekers are in the community legally, while others are illegally detained on Nauru, Manus or one of the on-shore gulags awaiting processing. No. The 62,000 illegal immigrants are mainly visa over-stayers from China, Malaysia, US, Britain and India. Thirdly, mathematics and the science of probability. That means that illegal immigrants account for 0.26% of the population. According to the Melbourne City Council, the population of inner-city Melbourne is 844,000 (6). It is highly unlikely that the entire illegal immigrant population is in the Melbourne CBD. It is likely most our outside of the CBD area. But even if the same rate of 0.26% applies, that could mean up to 2,000 visa overstayers in Melbourne CBD on a given day. Sounds like a lot, but randomly selecting people out of a crowd of 844,000 is really stretching the odds. They might pick up one or two if they're lucky. But considering that people don't need to carry papers it will be difficult to prove that someone is a visa overstayer. Do these odds justify unleashing the ABF, Victoria Police and seven other agencies, including Metro Trains, Yarra Trams, Sheriff's Office and the Taxi Services Commission? The problem is that most of the illegal immigrants aren't Muslims even though this is the image that the Liberal Party has been promoting. Operation Fortitude was not just designed to further instill fear. It was designed to reinforce racism and Islamophobia in the community. Although Abbott has stated that government officers will never stop people to check visas (9), the problem is that the operation was conceived in the first place to fulfil the government's hard-line approach to immigration. Many Australians are willingly exchanging freedom for an illusion of security based on delusions and deception. This has been drummed home by Abbott's comments in an interview in which he accused a journalist of hyperventilating over the press release, which he claimed was a mistake. What wasn't a mistake was that the ABF et al were being mobilised. Coordinating nine federal and state government agencies does not happen accidentally. Denial of such an operation is yet one more lie that shows the contempt the Liberal Party has for the electorate. Fear and deception are the LNP's modus operandi. Howard used fear and xenophobia to great effect through his dog-whistling rhetoric and deceit about the Tampa, Children Overboard, boat arrivals, weapons of mass destruction, Afghanistan, Iraq, terrorism and so on. Abbott is perpetuating this and taking Australia down a path of fascism, dehumanisation and supremacist thinking that some people are worth more than others and that liberty and rights are less important than the illusion of 'security' based on LNP lies and fear-mongering. 1. Article 31.1, United Nations Convention Relating to the Status of Refugees and its 1967 Protocol, adopted 28 July 1951, entered into force 22 April 1954, http://www.unhcr.org/496365eb2.pdf. Accessed 30 August 2015. 2. Sydney Morning Herald, Nicole Hasham, '$10 million splurge to rename Australian Border Force', 26 August 2015, http://www.smh.com.au/federal-politics/political-news/10-million-splurge-to-rename-australian-border-force-20150825-gj7rz2.html. Accessed 30 August 2015. 3. Sydney Morning Herald, Nicole Hasham, 'Australian Border Force farce leaves Tony Abbott under fire', 29 August 2015, http://www.smh.com.au/federal-politics/political-news/australian-border-force-farce-leaves-tony-abbott-under-fire-20150828-gjab4y.html. Accessed 30 August 2015. 4. Sky News, AAP, 'Dutton's office ignored Border Force briefing', 30 August 2015, http://www.skynews.com.au/news/top-stories/2015/08/30/dutton-s-office--ignored--fortitude-briefing.html. Accessed 30 August 2015. 5. Department of Immigration and Border Protection, 'Australia's Migration Trends 2013-14', http://www.border.gov.au/ReportsandPublications/Documents/statistics/migration-trends13-14.pdf. Accessed 30 August 2015. 6. City of Melbourne, 'Melbourne in numbers', https://www.melbourne.vic.gov.au/AboutMelbourne/Statistics/Pages/MelbourneSnapshot.aspx. Accessed 30 August 2015. 7. ABC Radio, Elizabeth Jackson, 'Operation Fortitude parto f an agenda to create fear: Tony Windsor (full interview)', 29 August 2015, https://soundcloud.com/amworldtodaypm/operation-fortitude-part-of-an-agenda-to-create-fear-tony-windsor-full-interview. Accessed 30 August 2015. 8. ABC News, 'Controversial Australian Border Force visa checks, Operation Fortitude cancelled', 28 August 2015, http://www.abc.net.au/news/2015-08-28/operation-fortitude-cancelled/6733008. Accessed 30 August 2015. 9. ABC News, Susan McDonald, 'Australian Border Force: Tony Abbott promises officers will 'never' stop people for visa checks', 30 August 2015, http://www.abc.net.au/news/2015-08-29/abbott-promises-abf-will-never-stop-people-for-visa-checks/6734910. Accessed 30 August 2015.